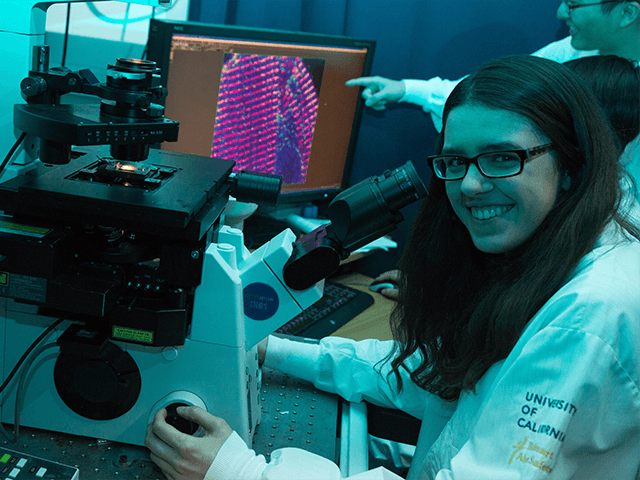 UC Davis students benefit from integrated research experiences and access to leading edge technologies and facilities. David Slipher/UC Davis. Ranked among the top graduate schools in 2014 for biological sciences, eight graduate programs in biology-related disciplines at UC Davis are managed by interdisciplinary graduate groups through the College of Biological Sciences. These advanced programs will prepare you for a successful career in life sciences research. Learn more by reading the overview and visiting the website link for each program below. The Animal Behavior program explores adaptive and evolutionary aspects of animal behavior. Program members take many theoretical and methodological approaches, employing a wide range of animal species in their research. You’ll receive training for instruction and research in areas relating to many disciplines, including anthropology, animal science, conservation biology, ecology, entomology, neurobiology, psychology, physiology, veterinary science, wildlife biology and zoology. The BMCDB program comprises students and faculty who share an interest in studying fundamental biological problems at the molecular, cellular and organismal levels. Experimental approaches range from the atomic and ultrastructural levels to model organisms that include yeast to mammals. Research interests reflect traditional strengths in biochemistry, molecular biology, and cell and developmental biology as well as approaches that combine biology, genetics, genomics, physics, engineering, math and computational disciplines. You are encouraged to explore focus areas through core courses and four first-year rotations. The Biophysics program prepares students to conduct independent research at the interface of physics, chemistry, and biology. You’ll develop and employ advanced research methods, using state-of-the-art tools to measure physicochemical phenomena in biological systems. Research areas of emphasis include structural biology, nano-scale engineering, molecular dynamics, macromolecular organization, and computational and theoretical biology. The program is designed to ensure students’ dialog with Biophysics faculty members through seminars, specific courses and rotations. The IGG program provides students with solid training in many disciplines of modern genetics and participation in both foundational and applied research in genetics and genomics across all domains of life. The program offers both Ph.D. and M.S. degrees. IGG offers unique opportunities for research in genomics, computational biology, classic, molecular and evolutionary genetics relevant to microbial, plant, animal and human populations. The MCIP program develops a strong foundation in the multi-level functions of living organisms, offering Ph.D. and M.S. degrees and joint Ph.D./M.D. and Ph.D./D.V.M. programs. Research interests include general areas of cellular, molecular and systemic physiology as well as specialization in cardiovascular physiology, comparative physiology, endocrinology, exercise physiology, neurophysiology, reproductive physiology and the physiology of domestic animals. The Neuroscience program offers interdisciplinary training for Ph.D. students in all areas of neuroscience, from molecules to cognition. Students in our program receive exposure to a myriad of clinical problems that challenge brain health. Areas of focus include brain development and aging, synaptic function and plasticity, sensory processing and motor systems, learning and memory, computational neuroscience and disease. The focal point for research on campus is the Center for Neuroscience. The Plant Biology program grows an understanding of foundational and applied plant knowledge and research, ranging from individual molecules to entire populations. Research specialization areas include cell and developmental biology, environmental and integrative biology, molecular biology, biochemistry and genomics, and systematics and evolutionary biology. The program offers both Ph.D. and M.S. degrees. The Population Biology program operates at the interface between ecology and evolutionary biology. Research interests explore population growth, structure and dynamics, population interactions, community ecology, food webs, biogeography, behavioral and physiological ecology, life history strategies, systematics, evolution, population and quantitative genetics, and genomics. View the profiles of more than 125 college faculty members.